A determined team of science faculty members, a new president, and a trusting donor transformed the future of UO science in a little more than 14 months. But the dramatic change they engineered was built on a 60-year culture of collaboration. The announcement of Phil and Penny Knight’s gift of $500 million to initiate the Campus for Accelerating Scientific Impact was a defining moment in the University of Oregon’s history—one shaped by the UO’s culture of collaboration, but given impetus on a warm August night in 2015. Less than a month after taking office as UO president, Michael Schill invited a few guests to dinner at the McMorran House to talk science. Bill Cresko, a professor of biology; Jim Hutchison, the Lokey Harrington chair in chemistry; and Brad Shelton, the UO’s chief research officer, were key players in the university’s science community. Cresko had been on the president’s search committee and had already briefed him about the UO’s strengths in fundamental science. 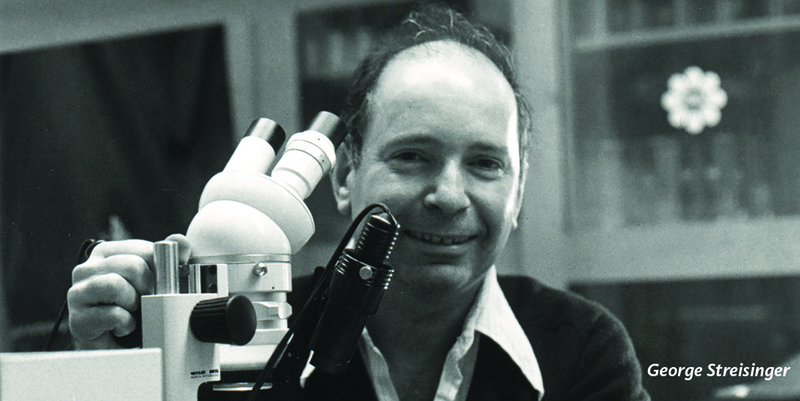 Hutchison was a trailblazer in the field of green chemistry education and, as director of the Materials Science Institute, was a driver among those on campus viewing science through the lens of the market. His guests relished the topic. They talked about building on the UO’s collaborative culture, an advantage over engineering and medical schools, which often constrained their researchers in rigid silos. They described the university's innovative approach to graduate education in the sciences, highlighted by an applied master’s program and graduate internships. They enthused about the UO’s advances in working at the nanoscopic level and achievements in the fields of genetic sequencing and host-microbe systems biology. And they related how the university’s data and research capabilities were aiding the top-ranked College of Education in development of interventions to help children and families, now boosted by the recently funded faculty cluster in obesity prevention and health promotion. Schill was looking for the huge, gutsy idea that he could take to the UO’s best donors as an investment to provide the university’s academic profile with a turbo boost. He was asking the scientists for their moon shot. And it needed to be about impact. It was a reboot moment. For some time, in various forums, faculty members from across fields—prevention science, human physiology, evolutionary biology, chemistry, physics, math, and others—had explored ideas for growing the sciences at the UO. Their free flowing conversations were an outgrowth of Oregon’s collaborative culture, which has its roots in 1959, when faculty members Aaron Novick, Frank Stahl, and George Streisinger formed the Institute of Molecular Biology. A highly integrated ecosystem where physicists, chemists, and biologists worked together to dissect the molecular underpinnings of living organisms, it spawned a philosophy that spread across campus to fields as far-ranging as neuroscience, the humanities, and social and emotional human development, eventually giving rise to more than 20 UO research centers and institutes geared around interdisciplinary collaboration. Now, it was time to collaborate for a different purpose. Cresko was tasked by the president to chair a committee that would crystallize the ideas raised at the dinner. He asked his colleagues to construct a vision for translating more of their discoveries into outcomes that would have more significant impact on the world. The first step: they had to define impact. Over the next few months, two dozen faculty members engaged in fertile and often heated discussions. Did impact mean focusing on a specific goal, like curing cancer or diabetes? Improving the environment? Developing new forms of sustainable energy? Or did it mean publishing more research, hiring more faculty, and expanding the pipeline for graduate students? President Schill insisted they dream even bigger. What emerged was a definition not restricted to any one outcome, but rather an over-arching approach to results-driven research guided by a mission to improve health and well-being. They envisioned a campus built on our strengths in interdisciplinary scientific innovation that would accelerate societal benefits. It would be an environment of intellectual fluidity where, for example, researchers could take an engineer’s view toward solving complex biological problems and where endowments would create ‘fighting funds’ to allow researchers to quickly pursue new ideas and gain a competitive advantage for additional external funding. The UO could build on its success with shared research facilities such as the Center for Advanced Materials Characterization in Oregon (CAMCOR), and provide access to robots and advanced imaging techniques to rapidly screen thousands of compounds for their effects on neural development, then immediately test the most promising of those in a neighboring lab. The faculty group envisioned new opportunities for the next generations of science students who are thirsting to put their curiosity and creativity to work for the greater good. And one of the most promising impacts would be to create a more diverse community of researchers, says Karen Guillemin, a biologist and director of the UO’s META Center for Systems Biology. At this new, buzzing intersection, where entrepreneurs, marketers, law students, and product designers were embedded along with scientists, post-docs, and their support teams, the most significant result could well be the mountain of new ideas. “The people capital, that’s going to be one of the biggest legacies of this gift,” Guillemin says. And that, says Cresko, was the key. To build on nearly 60 years of history and strength in working together across fields of inquiry and across disciplines. Just like Stahl, Novick, and Streisinger. They had a vision for what it could be. Now they needed to figure out how to do it. The answer was across the river. Over the last 20 years, Phil Knight and key donors dared the UO’s department of intercollegiate athletics to be great. They backed up the challenge with extraordinary investments in innovative facilities and personnel that propelled Oregon's student-athletes to the highest levels of success and enabled the UO’s transformation from a school in the middle of the pack to a program nationally known for winning the day. That same approach could work for science: state of the art facilities, the addition of top tier scientists who would fit into the university's culture of cross-discipline collaboration, and a focus to accelerate discoveries for the benefit of society. And it would be uniquely Oregon. Because donor relations can be very sensitive, faculty involvement had to be limited and confidential. While the framework for the project was drafted and approved by the committee, Cresko, Guillemin, Hutchison, and Shelton moved ahead, representing their colleagues and working with the UO’s development office to distill the text into a proposal. It imagined a group of three buildings across Franklin Boulevard from the existing Lokey Science Complex, creating a flourishing science corridor where teams would have fast access to a huge variety of model organisms, human subject interaction spaces, techniques, tools, and their own creative minds to apply their discoveries into potential innovations, interventions, and cures. “The Campus for Scientific Impact” now had an estimated price tag of more than $1 billion and donors who believed in it passionately enough to receive a proposal. In December 2015, just a few months after the “moon shot” dinner and the rapid work of the faculty members to refine the concept, President Schill’s team, including Vice President for Advancement Mike Andreasen and Guillemin, Cresko, and Hutchison, made the drive to Beaverton to deliver their pitch to Phil Knight. The breathtaking news came that the Knights were ready to commit to a revolutionary $500 million lead investment. On the morning of October 18, before President Schill announced the project to the public, he invited the faculty committee members to breakfast to salute them for their unheralded role in creating the project.